Nokia is finally offering insight into why it chose to exclusively support Microsoft's unproven Windows Phone platform instead of the more popular Android operating system. It boils down to one word: Samsung. "What we were worried about a couple of years ago was the very high risk that one hardware manufacturer could come to dominate Android," Nokia CEO Stephen Elop told The Guardian. "We had a suspicion of who it might be, because of the resources available, the vertical integration, and we were respectful of the fact that we were quite late in making that decision." Samsung has indeed become the go-to manufacturer of Android devices and has even replaced Nokia, now No. 2, as the top phone maker in the world. 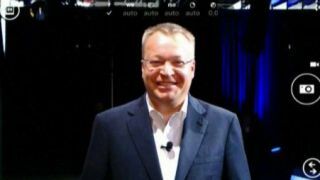 Elop noted that there are a lot of quality Android devices on the market right now, which could allude to the HTC One, but Samsung continues to overshadow its Android competitors. "Examine the Android ecosystem, and there's a lot of good devices from many different companies, but one company has essentially now become the dominant player." Instead of being another HTC with poor financials, Nokia predicted that it was better off being part of a "third alternative." "As an operator [AT&T] wants to negotiate with different people and keep pressure on everybody and have the best range of options, [and] wants that third alternative. "So strategically we have an opening with AT&T and every other operator in the world - because we've taken that path as the third ecosystem." Elop admitted that it's been difficult, as Nokia's use of the Windows Phone platform makes it a credibility-seeking challenger with phones like the new 41-megapixel Nokia Lumia 1020 running Windows Phone 8. Still he contends that the Finnish company's agreement with Microsoft was the right move. "It was the right decision," he said. "You look at a number of other Android providers right now and they're in a tough spot."